Thermo Engineers has developed a niche of offering excellent products and services to its huge clientele in market. The firm got established in the year 2006 as a Sole Proprietorship firm and has shown praiseworthy progress in business. We are located in Jaipur, Rajasthan and performing our entire business operations with complete ease from there itself. We are primarily a Supplier and Service provider of a huge gamut of products which include Thermal Insulation, Industrial Insulation, Turbine Insulation, Scaffolding Framework, and many more. The whole range offered by is well known for its efficiency and perfect performance. Our vendors ensure the products are manufactured with high grade material ensuring versatility and flexibility leading to impeccable performance. We are committed to the welfare of clients and make sure the products meet their entire needs without making any hassles. The organization has been a huge success with the excellent support of Mr. Harendra Patel (Proprietor). He showed how experience coupled with hard work can produce desired success. Both of them are broad-minded and flexible, thus creating a huge scope for flexible approach for entire business. The organization is poised to achieve excellent success in its all endeavors with such unrelenting support. We are well aware of modern business methods and thus, function accordingly to keep pace with other competitors in market, our this habit has helped us in attaining formidable position in market and enjoying innumerable benefits. People working in our team have high devotion towards their work with unquestionable integrity. We are proud to have a pool of people possessing excellent domain knowledge with a strong desire to excel. Their efforts are paying dividends as our business is making smooth progress with every passing day. We make sure personnel working in our organization enjoy their work and we do our best to resolve their any issues related to work or even personal. The entire range of Insulation Material and Services which we are providing is quality approved and personally checked by our quality professionals to ensure its authenticity. It is not only the products that we boast about, we are also confident about services we offer, as they are quality oriented and performed under perfect supervision. We make sure clients face no hassle in performing business with us and several provisions are made in this direction. Our entire business policies are client oriented as we have a strong conviction to make them happy. Quality renders utmost satisfaction to the customers who enjoy our products. We understand what they seek and make it a pivotal point to facilitate them with the same. In this regard, we examine our vendors on various parameters to confirm their reliability and make them clear of our prospects in business circle. These vendors use quality tested material in developing the range. They carry the entire production activity under the supervision of quality professionals who are well aware of set international norms and implement them in earnest. Thermo Engineers owes its success to its state-of-the-art infrastructure that executes entire functions of the company in awesome manner. We have equipped our quality unit with specially designed machines and sophisticated technology to ascertain the authenticity of quality of products. Our warehousing department is highly commodious to store bulk products without causing any hassle enabling us to meet huge consignments in due time. The team of suppliers is excellent in providing fast and effective services to distantly stretched clients. We are an astute organization engaged in rendering Insulation Services to our valued patrons. To cater to the varied needs of the patrons in an efficient and effective manner. With our client-centric approach, transparent dealings and ethical business policies, we have been able to garner a vast client base for our organization. We are an established organization engaged in rendering high class Insulation Services to our valued clients. Our team of hardworking professionals follow basic strategy patterns before executing these services. Moreover, they collect basic knowledge from the clients end to fulfill their demands in an easy and efficient manner. They make use of high quality raw material, advanced methodology and latest techniques for completing the task assigned to them. Furthermore, these services are extensively used in various sectors like cement, fertilizers, chemical industries and others. We are an eminent organization engaged in rendering Insulation Services along with proper consultancy in designing, drawings and guidance of technical specifications for various types of acoustic, hot, cold insulation to our esteemed patrons. These services are executed in a timely manner to ensure maximum level of client satisfaction. 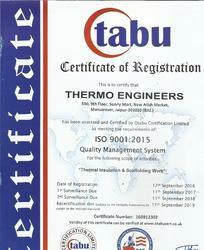 We Thermo Engineers are an ISO 9001-2015 company. 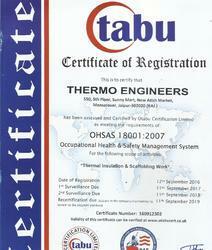 We Thermo Engineers are an OHSAS 18001-2007 certified company. We are a prominent name in the market for the excellent work we have been doing in the industry for our valued clients. Providing a huge array of unmatched quality products to clients has given us a distinct identity in the market.